*These stories are continued from TMNT New Animated Adventures #14. 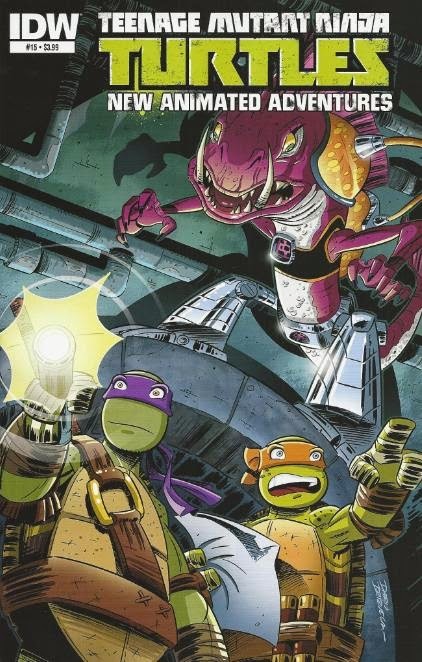 The stories continue in TMNT New Animated Adventures #16. *This issue was originally published with 3 variant covers: Regular Cover by Brizuela, Cover RI by "S-bis", and Cover RE by Dave Alvarez. Are you going to review Volume 4 anymore? I plan on getting back to it soon. I've just had an unexpected deluge of boring real world trivialities soaking up my time for the past month or so. It's been hard enough just trying to keep up with the current IDW releases. But I should be getting back to Mirage issues in a little while; I'm looking forward to it, too.